NEW YORK, NY--(Marketwired - Nov 5, 2015) - NGOs, project holders and a notable line-up of international speakers came together at the Social Innovation and Global Ethics Forum (SIGEF 2015) -- a three-day international event dedicated to celebrate positivity, diversity, creativity and action worldwide. Horyou, the social network for social good, and the Horyou Foundation hosted the second edition of the Social Innovation and Global Ethics Forum at the Bâtiment des Forces Motrices in Geneva, Switzerland, Oct. 23 - 25. Philanthropy Promotion Award: Mrs. Peng Jianmei - Executive Secretary General, China Charity Alliance. A delegation of the China Charity Alliance, whose aim is to promote public understanding of philanthropic culture in China and abroad, flew to Geneva for the occasion and also to participate in the European philanthropic tour organized by Horyou. Also, Dr. Georges Bwelle, founder of ASCOVIME and recipient in absentia of last year's SIGEF 2014 Humanitarian Award was handed by the President of Horyou, Mr. Léon Parienti. As a concluding remark, founder and CEO, Yonathan Parienti announced the launch of the #GreatDoingGood by Horyou campaign. "SIGEF 2015 marks the starting a of global call for positive actions. Our work continues as promoters of social good, so we are happy to announce the launch of our #GreatDoingGood campaign which encourages everyone to adopt a connect-for-good attitude. You can follow and support the campaign online via Horyou, Horyou App and the GreatDoingGood.com website. More information will be shared in the upcoming weeks." 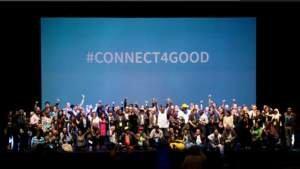 Over 60 international media outlets and partners brought global visibility to the second edition of the Social Innovation and Global Ethics Forum - SIGEF 2015. The forum was streamed live and covered by more than forty international media partners worldwide. On a special note, SIGEF 2015 media partner Pencilline, a media provider company based in Riyadh, broadcasted SIGEF 2015 event in 20,000 taxis' mobile televisions over the full three days, across the Kingdom. SIGEF 2015 Partners - China Charity Alliance (China), AlHilal Saudi Club (Saudi Arabia), Bâtiment des Forces Motrices (Switzerland), Taxiphone (Switzerland), Mandarin Oriental (Switzerland), Tesla (Switzerland), Cité de la Solidarité Internationale (Switzerland), Impact Hub (Switzerland), AIESEC (Switzerland), Geneva Youth Hostel (Switzerland), UNESCO Youth Forum (France), Republique and Canton de Genève (Switzerland), Nespresso (Switzerland), Chamber Arab Swiss Chamber Commerce and Industry (Switzerland), Ville de Genève, B Corp (Switzerland), Webster University (Switzerland), HES-SO (Switzerland), Horyou (Switzerland) and Horyou Foundation (Switzerland). SIGEF 2015 Media Partners - EcoMania (Argentina), Ser Sustentable (Argentina), Gestion Sustentable (Argentina), Sustentator Blog (Argentina), European Youth Awards (Austria), Ell FM (Cameroon), Wwwhat's New (Brazil), Instuto Filantropia (Brazil), Saúde Lazer (Brazil), Mymag (Brazil) Blog O Mais Importante (Brazil), BF1 TV (Burkina Faso), Afrique IT News (Cameroon), Diario Sustentable (Chile), Pegas Con Sentido (Chile), ENTERCO (Colombia), Café Babel (France), Fundraiser Magazin (Germany), Irish Tech News (Ireland), Disruptivo.tv (Mexico), DocsDF (Mexico), Se Responsable (Mexico), Fundacion Albatros Media (Panama), Pencilline (Saudi Arabia), Nunnovation (South Africa), Diario Responsable (Spain), Corresponsables (Spain), Le News (Switzerland), Sept.info (Switzerland), World Radio Switzerland (Switzerland), Rostigraben.ch (Switzerland), Les Visionautes TV (Switzerland), Horyou Blog (Switzerland), Lemultimedia (Switzerland), Blogstock (UK), ISPIM (UK), Alliance Magazine (UK) Causecast (USA), Inc. (USA), Mom Bloggers for Social Good (USA), Innov8Social (USA), Real Leaders (USA), OLV (USA), Ethical Marketing (USA), Governance and Accountability Institute (USA), PVBLIC Foundation (USA), Horyou Media (USA).